I have a beautiful throw rug with black, tan, and red in it. The rug pattern is busy. I want to use this in my bedroom, however, I don't really know what color accessories or comforter to use. 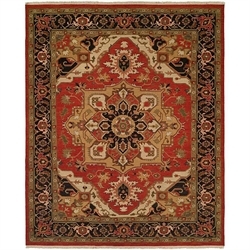 I love this rug and don't want it to get lost in a room with a lot of other competing patterns. The carpet is tan and the walls off-white. I don't really want it to look too dark or boring. I think your best option is to use two or three of the colours in the rug but to try to keep them as blocks of solid colour rather than introduce more pattern into the room. With your tan carpet and off-white walls you could opt for a classic cream bed cover and maybe brighten it up by adding some throw pillows to the bed in bright rusty red.